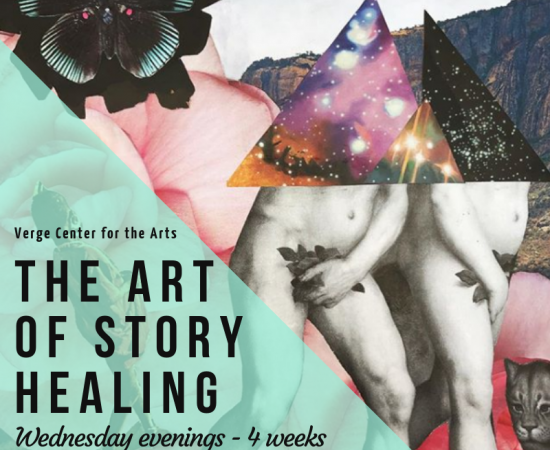 The Art of Story Healing is a 4-week class designed to give the space and safety to unearth, understand, and transform your relationships to your personal stories. By creatively investigating and sharing your experiences through multiple creative media, this dynamic delve into your personhood will help you to remember your resilience, while boosting your capacity for self-confidence, compassion and forward movement. For our first session, we will be building our relationships to our personal identities, the foundation for our stories. We will do this by diving into the enchanting world of images, working with the accessible medium of collage to explore symbols, patterns and themes of our lives. We will collectively brainstorm the differences between the selves we present to the world and the parts of us that we keep hidden and safe inside. We will collage the covers of our journals (inside+outside to correspond with inner and outer worlds). The journals will serve as safe spaces for our story exploration in the subsequent workshops. In this session, we dive into a simple formula for telling/writing our stories (identifying a “before” state/starting point, introducing the challenges that changed that state, and searching for the meaning that came of those challenges/changes). We will also workshop a useful technique for organizing ideas and events, getting them out of our heads and onto paper before composing them into narrative format. In this session, we will be looking at the process of creating our stories as we go, before we even know what the story is necessarily about. We are always existing inside of our own story, and the act of documenting our moments is a way to bring our stories to life. (We will be using images developed from disposable cameras, given to participants in session 1). In this session, we will move through an intention-setting process to clarify what it is we are wanting to call in to our future stories, while at the same time, creating visual space and allowance for the great mystery to unfold.